Sending photos and a note along, James and we look forward to seeing your post. 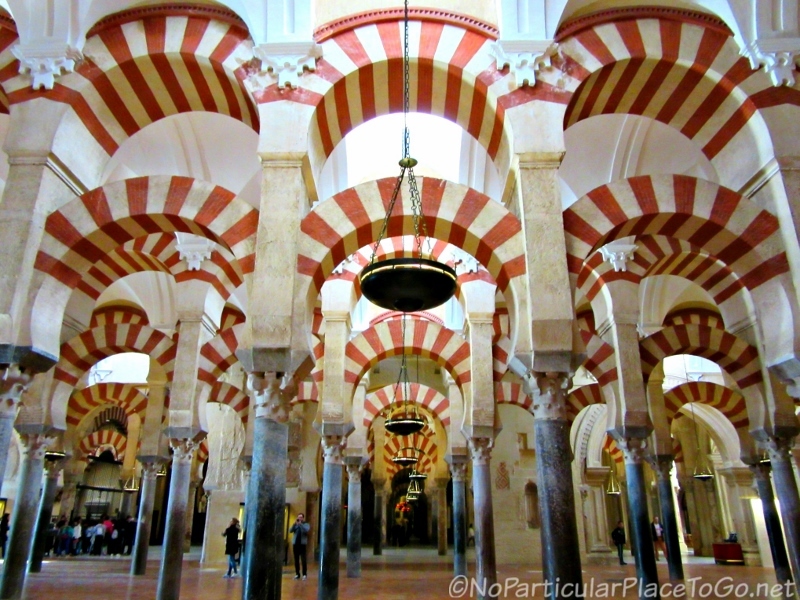 I loved seeing your photos of the Synagogue of Santa Maria la Blanca and the “white version” of the arches compared to the very striking red and white stripes of the Mosque-Cathedral. Madrid, Leon and Toledo are at the top of the list for our next visit to Spain! We’re so glad you enjoyed our photos and thank you for taking the time to comment. 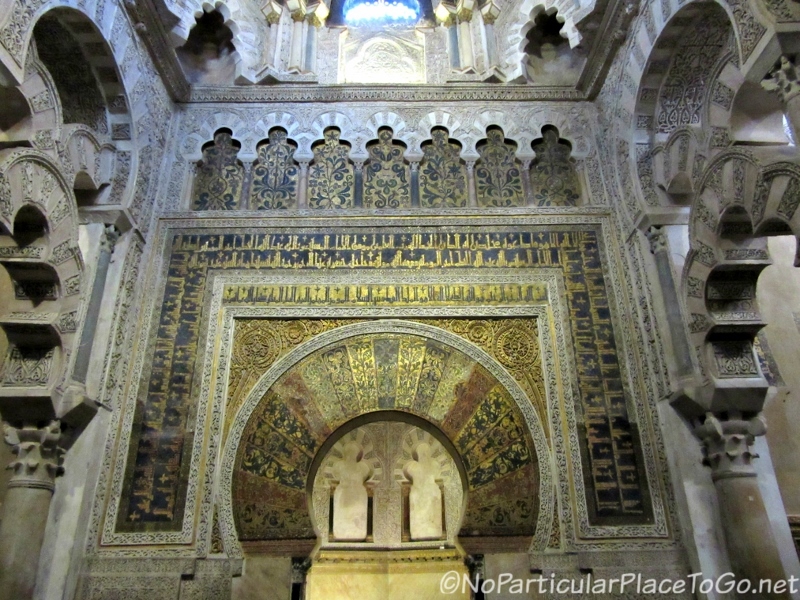 The Mosque-Cathedral is definitely a bucket-list destination and well worth a visit. Here’s hoping you have a chance to see this amazing place for yourself in the near future. We’re so glad you enjoyed the history James as the research is one of our favorite parts about actually writing the post. A lot of times (in the immortal words of Bob Seger) we have a hard time deciding what to “leave in and what to leave out.” By now, we’ve seen many examples of Moorish Architecture and we love the geometric designs and motifs as well as the carved stucco and other building materials that are found throughout. What we find particularly compelling, especially going through our pictures a couple of months after our visit, is the contrast in styles and visions of each religion and how the effect was almost synergistic. This makes the visit to the Mosque-Cathedral totally amazing as you spend your time trying to absorb as much detail as you can. We have yet to see the Hagia Sofia (still a high priority on our bucket list and Turkey isn’t that far from Portugal) but we’d have to agree that the Mezquita is at the top of our list of favorite buildings as well. Absolutely awe inspiring! I absolutely loved the history lesson you provided along with those stunning photos Anita. Terry and I are leaning towards a visit to Spain and Portugal next year. I will keep you posted. Would love to meet the two of you. One of the most fascinating places I’ve ever visited. Your history lesson is excellent. We agree with you Caroline, that the Mosque-Cathedral is magnificent. And thanks for your compliment on the history lesson. One of the hardest things about writing this post was distilling all the interesting information that we read (so many rabbit holes to fall into 😀) and boiling it down to a few paragraphs! HI Anita. 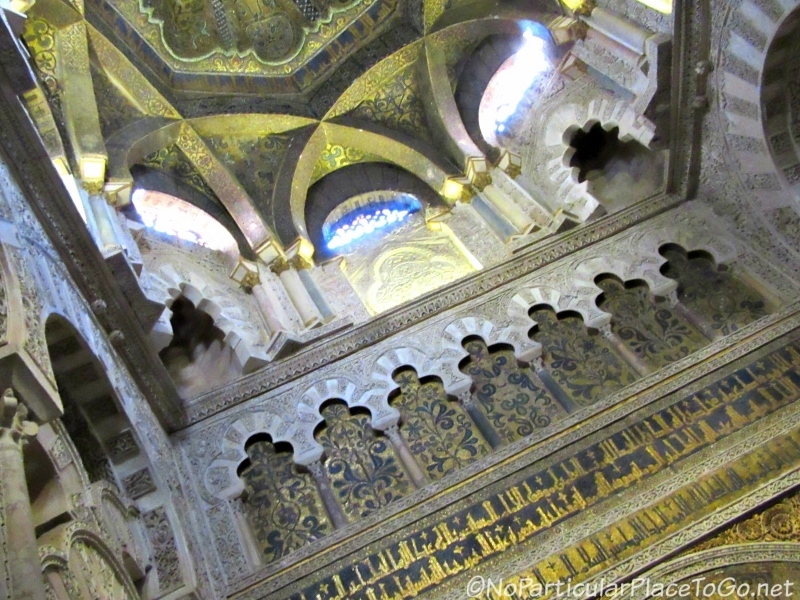 I, too, was amazed at the wonders of the Moorish structures and presence of Muslim influence in Spain. It really adds another dimension to the architecture. The architecture and art during the Moor’s time in the Iberian Peninsula can be found in so many villages and cities in both Spain and Portugal. Traveling through these countries is an endless discovery of the skills, craftsmanship and artistry that the Moors brought with them as well as their culture. Fascinating and fun, Doreen! This is awesome! 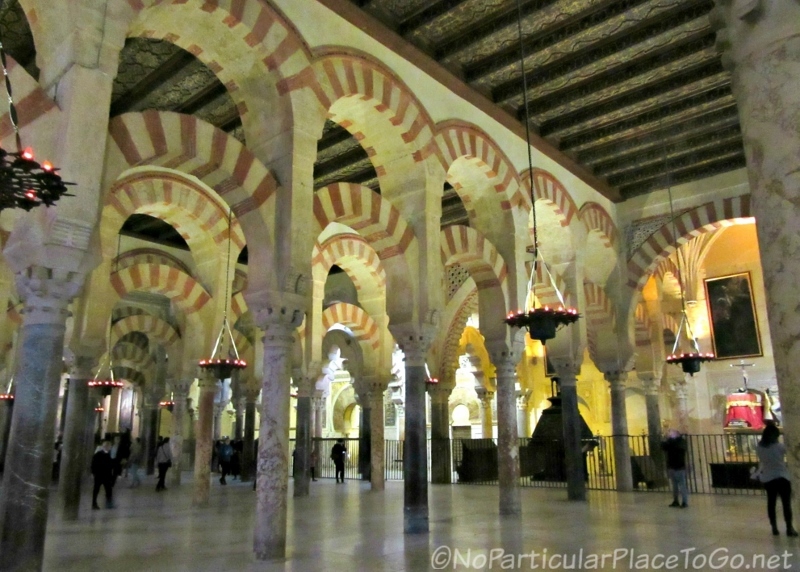 When I saw your last post about Cordoba and did some investigating and came across this lovely space, but I couldn’t find any pictures that gave a proper idea of the inside. I was also reading about how both religions worshiped there simultaneously for a little while, but the church won’t let that happen now… which is definitely a shame. The Mosque-Cathedral is one of the most beautiful and amazing places that we’ve visited and going through the mountain of photos we took of our visit reminded us of all the details that can be overlooked while you’re there. It’s simply magnificent. And we agree, it would be a wonderful gesture of tolerance if both religions were able to practice their religions in the shared space. One of the strangest and most monumental places I’ve been in. I didn’t realise there was a cathedral inside it (I’m one of those people who don’t do as much research as they should before visiting places) and I was bowled over when I came to that cathedral. Nothing like it that I know of. Thanks Ralph for stopping by our blog and taking the time to comment. I think, regardless of how much research you’d put in before a visit, that the Mosque-Cathedral is a place that can still “bowl” you over. We’d seen pictures of it and heard friends describe it but our actual visit there still resulted in a tremble-at-the-knees kind of experience. Totally unique and awe-inspiring! 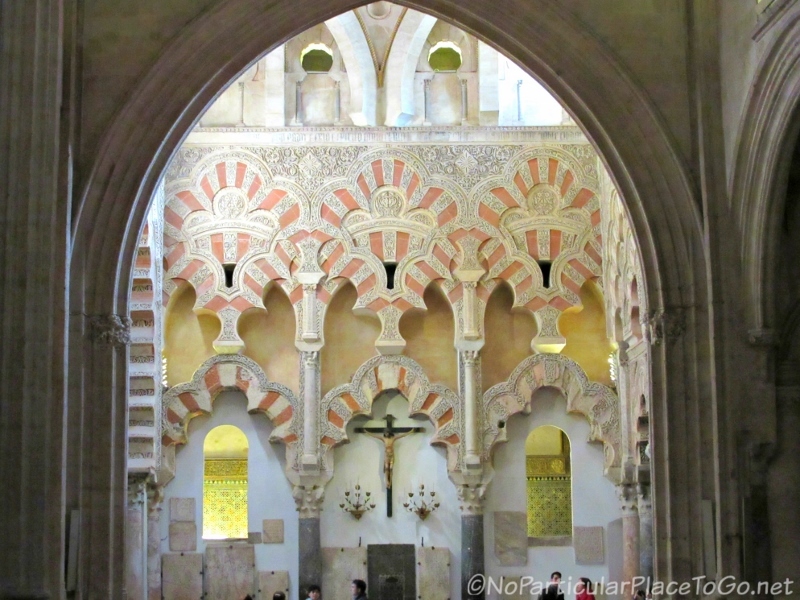 I’ve never been to Cordoba but your photos certainly took me there immediately. Very impressive! I love all the detail shoots you’ve included it’s just like an DK Eyewitness guide book. Would love to visit! Thank you, Sue. I think you’d love Córdoba, especially since it’s a foodie destination with great dishes and wines as well as beautiful places to visit. The city is charming, picturesque and steeped in centuries of culture and history. It might just be a place to put on your future travels list! Oh wow really lovely photos – such amazing detail and colours! Thank you, Becky. The Mosque-Cathedral is an incredible place and an amateur photographer’s dream. 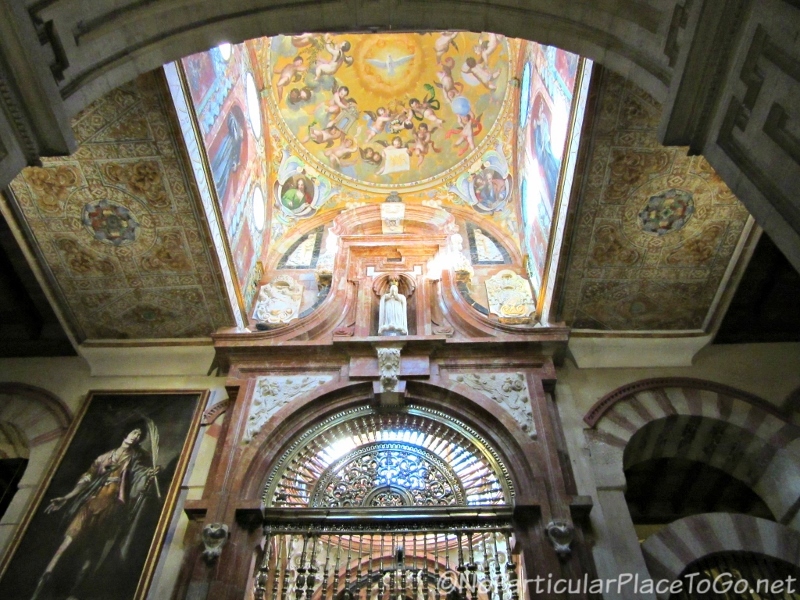 It’s definitely a “must-see” destination and Cordoba is well worth the trip. Fantastic photos! And we agree with you, it is the most splendid religious building we have ever seen (and we also visited the Vatican last year). Yes, you would think an arrangement could be made but in these times I don’t think there is much respect or tolerance on either side of the religious line. Isn’t religion great? What a stunning building. And what an interesting and a bit sad history. 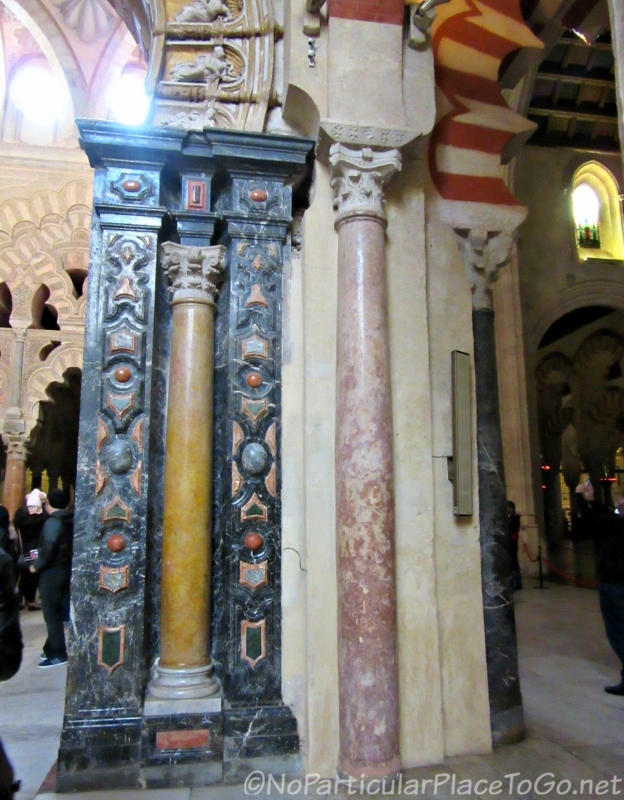 It would be nice if the Mosque-Cathedral of Córdoba could now be seen as a symbol of tolerance. 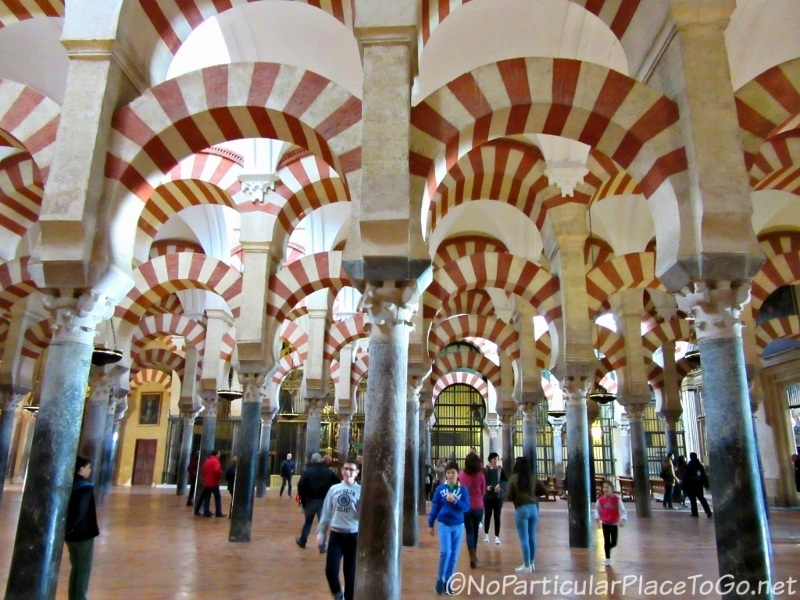 Wouldn’t that be awesome, Donna but, even though the diocese of Córdoba agreed to acknowledge the Islamic history of the building and include Mosque in the building’s name again, it will be a while before both faiths worship in the same building. However, we’re still very lucky that this amazing building was preserved for the most part so that we could all enjoy and learn about its history centuries later. It’s been over 20 years since I visited Cordoba, but I of course remember this well. (although it seemed to be much darker in my memory!) Beautiful photos. So glad you enjoyed the photos, Jane. Aren’t digital cameras great? We both remember all the money we used to waste on film and the great disappointment when our pictures would come back. There were areas in the building that were much darker but the lighting seemed to be pretty good during our mid-morning visit. 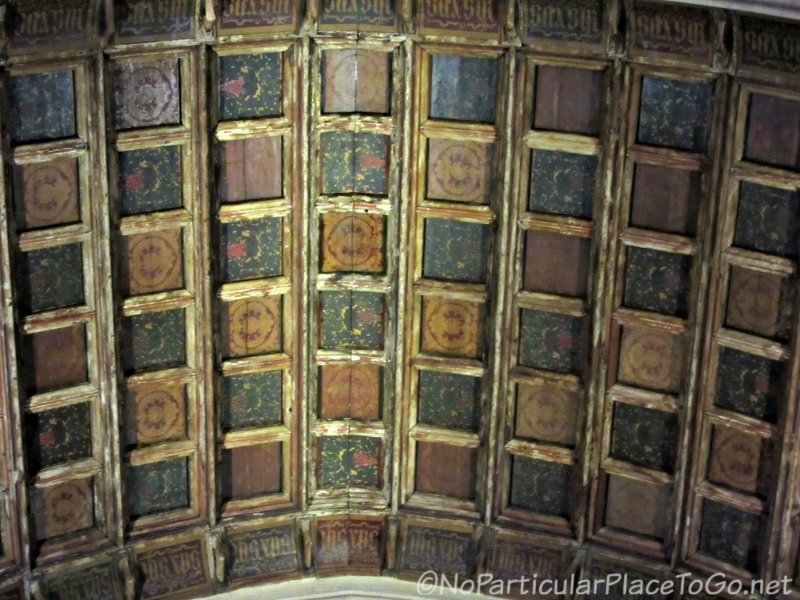 In fact, the sun was streaming through many of the upper windows and made some areas difficult to photograph. The Mosque-Cathedral is definitely a memorable place! Your images are stunning. I almost made it to Cordoba once, but unfortunately missed it. Your post filled in some of the dots for me. Thanks so much Carole. The Mosque-Cathedral is really an amateur photographer’s delight because everywhere you look there is something amazing to take a picture of. It’s too bad you missed Córdoba on your previous trip but we well know how difficult it is to choose between so many amazing destinations. Luckily, reading lots of travel blogs can give us both a taste of some of the many fascinating places! A very timely post my friend. This is a place that we must see when we return to Europe/Spain. 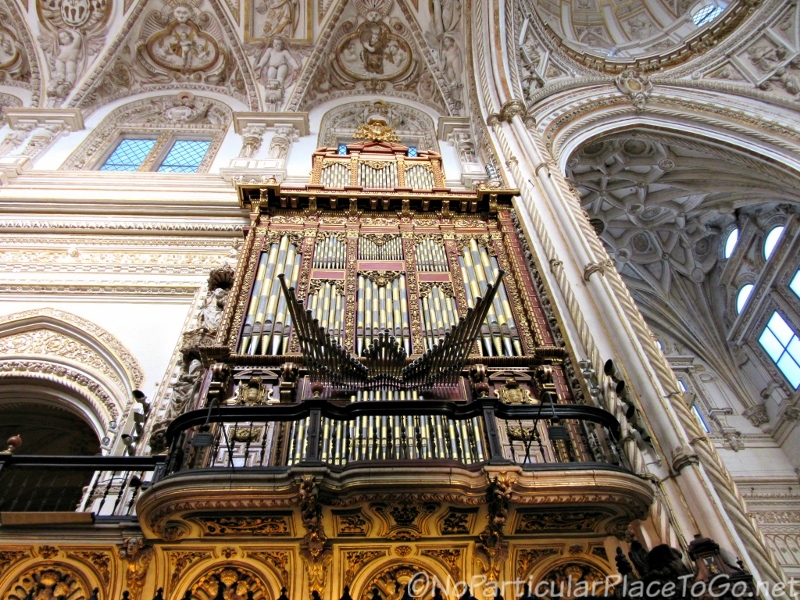 That pipe organ is absolutely stunning, I have such a fascination for them. And, I am fascinated with churches, cathedrals, etc in general, not for the religious aspect (that’s another story) but instead we find them full of lessons in architecture, art, symbolism, sociology, and so much more. Talk about learning through travel! Another knock out post! Those photos are spectacular and made for a great tour. We’ve not made it there and you’ve certainly got me thinking it is time to start focusing on some European destinations in 2017! You have us thinking the same, Jackie whenever you post about your stone house in Greece. If the visa gods smile upon you, you won’t have to do the “Schengen shuffle” when you come to Europe next which will definitely give you more time to explore. Maybe we’ll have to think of a house swap or, at the very least, meet in the middle somewhere new! Sounds good! Keep your fingers crossed for smiling visa gods. Such a well-written post again. We were in Sevilla in 2015 and missed going to Cordoba. This is really a must-see! But it is 3.5 hours from Albufeira where we will be when we go to Portugal. Hope to convince my husband to make this drive! Thanks for this post. Thank you Carol! It’s a lot of fun for us to relive/write about our travels and we’ve said before that we think we’re better travelers knowing that we’ll be writing about our trip later. You should really think about making the trip to Córdoba when you come to Albufeira. 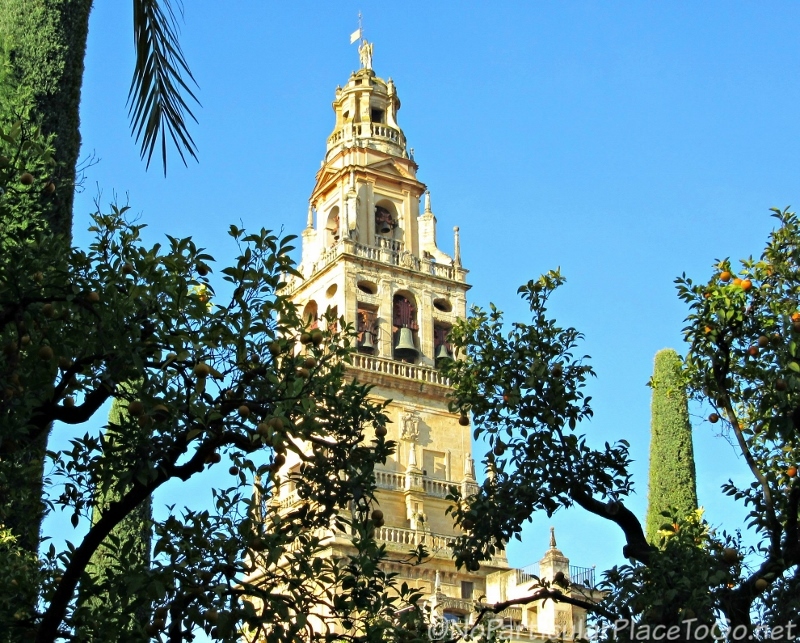 It’s an easy drive but maybe even easier by bus to Seville and then by bus or train to Córdoba because we’ve found the hardest part might be finding a place to park. 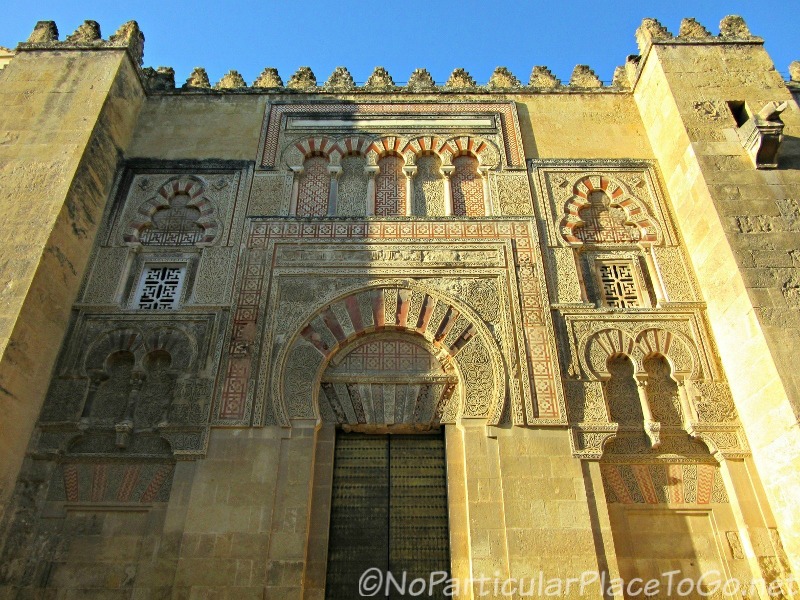 The historical area of Córdoba is compact and just a short walk to get to all of the must-see places. All of those descriptions are perfect Johanna. What makes the Mosque-Cathedral so interesting is that the Catholic Church also recognized what a unique place the mosque was and choose to keep so much of it by inserting the Cathedral in the middle rather than destroying the mosque altogether and building over it. Lucky for us, we have the best of both religion’s architecture in one space. 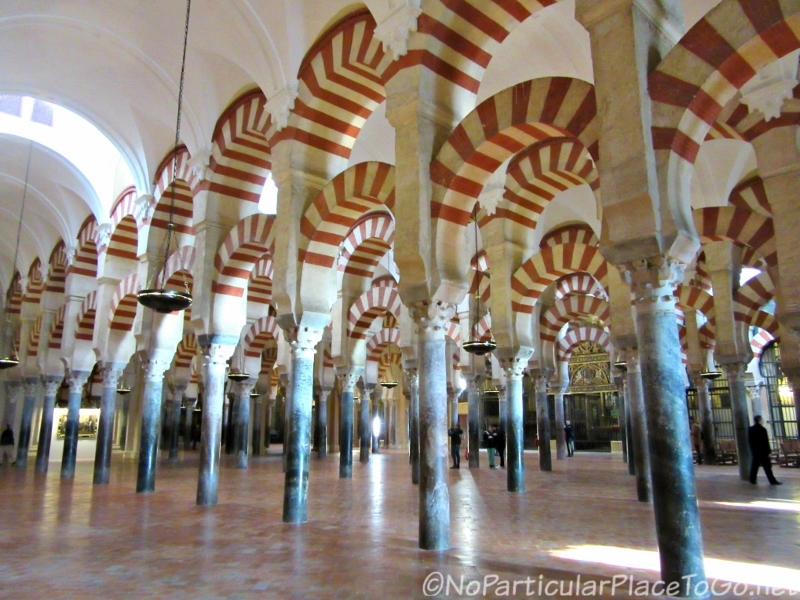 When I visited Spain over 10 years ago, I swear I visited Cordoba, but I guess not after reading your post. I definitely would not have missed the Mosque-Cathedral! It reminds me so much of the one in Casablanca. Enormous. Gorgeous. Looks like you might be thinking “time to take another trip to Spain, Jan!” We spent a few days in Casablanca last February and visited the Hassan II Mosque which really is lovely, ornate and massive with an impressive display of artistry. Until you’d mentioned it, we hadn’t thought to compare the two mosques. I think what I loved most about the Mosque-Cathedral were the repetitive red and white double arches and the sheer audacity of plunking a wedding cake cathedral right in the middle. Plenty of eye-candy no matter where we looked! I visited over 10 years ago and thought this cathedral to be fascinating and bizarre at the same time with the eclectic styles and massive redesigns, it really is a fascinating place to visit. It really is the most impressive religious site we’ve seen so far although we have yet to see Hagia Sophia or the Blue Mosque. The art, architecture and history made this one of our favorite places to write about and the recent controversy over the name made it all the more interesting. A beautifully written, instructive post. You and your gorgeous photography sharpened the memories I have of our visit to the Mosque-Cathedral in Cordoba three years ago. I, too, hope that someday all religions can live together and in peace. Seems like we should be singing “Imagine,” doesn’t it? 🙂 Thanks Pamela, for your kind words and I’m glad we reminded you of your visit which sounds like it made as big an impression on you as it did on us.The Mosque-Cathedral is a photographer’s dream and even amateurs like us can find some beautiful shots. We love to find places like this that have such fascinating stories and unfortunately, some very relevant lessons as well. 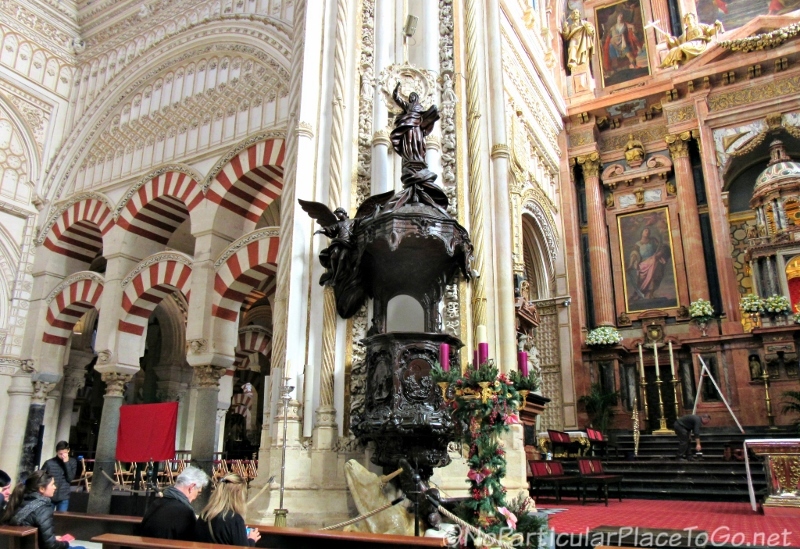 We visited Córdoba at the end of 2015. 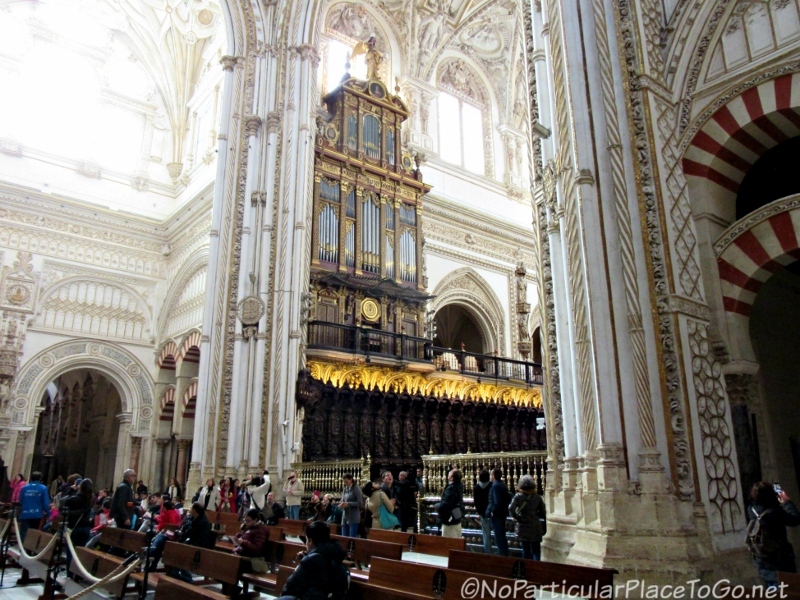 While the architecture of the Mezquita-Catedral is as wonderful as you describe, the history filled me with despair about how it seems to be constantly repeating itself. The brief period of religious “tolerance” that allowed Muslims and Jews to coexist was ended by the arrival of violent, strict, fundamentalist Muslims—sound familiar? Thank you for your lovely comment. We’re both history (and fast becoming political) geeks and find that it gives an important context to each place we visit. Unfortunately, with the things happening around the world as well as the recent display of religious intolerance by the current US administration, it’s easy to find connections between past and present. Hatred of “the other” in the guise of religion is especially deplorable. Amazing is right! Great shots! Thanks John and Susan. The Mosque-Cathedral is a place where you alternate between just wanting to gaze around and absorb the beauty and take pictures from every angle to remember it. Definitely in the awe-inspiring category! Isn’t it just spectacular? Awesome doesn’t even describe it. We absolutely loved our visit there. So much history and l totally loved the part of the multi religion usage of the place in the olden days. It shows indeed that we can all get along. At home, at least in the South of Nigeria, this is still the case. Christians and Muslims side by side. I wish l could say l had hope, but truthfully l do not.We are too hateful and fearful :-(. So glad you guys loved Cordoba. Thanks for the gorgeous (as always) photos, and the history lesson. Never heard of this before. I join in your hope for more respect and tolerance. It’s dazzling, Susan and I’m always puzzled when some people talk about being “churched out!” We’re not religious at all but so often the places where people have chosen to worship show a country’s best artists, architects and others with an appreciation for sheer beauty. And the Mosque-Cathedral is, without a doubt, the finest we’ve seen yet. Stunning building with a mix of styles that work so beautifully. It is heartwarming to see that this showstopper of a religious building is in fact a great example of how different religions can come together and exist side by side. It will be on my list of “must”visit places in the very near future. A showstopper for sure Gilda and you’re going to love it as well as the whole city of Córdoba. So often the mosques were torn down and the materials recycled into churches and cathedrals and it was extremely fortunate that the church chose instead to convert many of the mosques into churches. Such awesome accomplishments of architectural and artistic genius for us to learn about and enjoy! Another amazing post. The history as well as the beauty of this great place is amazing. Thanks for providing the history as well as the wonderful pictures. Our pleasure, Suzi and we’re happy to share our pictures and thoughts about the Mosque-Cathedral with friends like you who enjoy travel. It never ceases to amaze us how many amazing places there are nearby to explore and delve into the history and we feel exceedingly fortunate to experience some of them! Thank you Anisio for stopping by our blog and sharing this post with your readers. The history of the Mosque-Cathedral is fascinating and exploring this UNESCO World Heritage Site was an awe-inspiring experience. Definitely an understatement! 🙂 The Mosque-Cathedral is a place that’s jaw-droppingly awesome and makes you struggle to come up with more and more superlatives! Stunning beauty and most unique creativity! Maida, the Mosque-Cathedral was that and so much more. This was one of those times when, although we’d done some superficial reading before our visit, more in-depth reading afterwards was enlightening and made us appreciate this architectural wonder even more. Truly unique.